PERSONALIZED Moustache Pacifier, Mustache Pacifier with YOUR BABY Girl or Boy’s NAME or Short Message. Just type it into the Text Boxes. 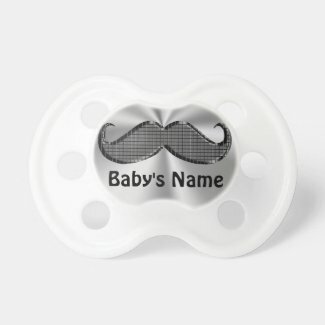 Personalized Moustache Pacifier will be a hit for personalized baby shower gifts. I created this cool Moustache Pacifier by Photoshopping a basic black mustache and adding Texture and cool gleaming effects giving it a coppery look and an interesting flare for a really unique mustache. High Tech Geek Mustache with Silver Background and High Techy Mustache. 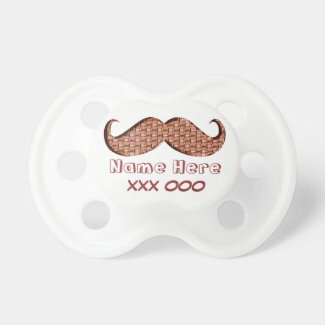 Type YOUR BABY’S NAME into the Text Box which can be found to your right of the Mustache Pacifiers once you are on the product page. Baby moustache pacifier UK, Australia, USA or can be shipped to most countries. Moustache soother to calm your baby while your friends smile at the cute mustache pacifier. 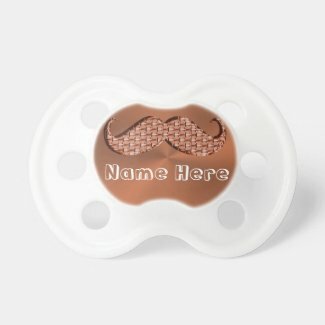 Mustache Pacifier with baby’s name. Zazzle Designer Little Linda Pinda adds her special touches making them one of a kind designs. It will be so much fun watching peoples faces when they see your baby with a Mustache Pacifier and Mustache Shirt too with cute sayings. 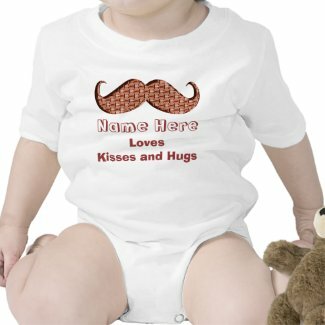 Type in YOUR BABY’S NAME and a Short Message instead of my message in the Text Box Templates to your right of the Mustache gifts, underneath “Personalize it” area. Choose One Piece Creeper or any Shirt Style in “Style Options” are to your Right of the Mustache Shirts. How cute would it be to have a Mustache Themed Baby Shower? I can create mustache baby shower decorations, invitations, party supplies and moustache gifts. Buy the Best Pacifiers with the Best Custom Printing from Zazzle. Amazingly clear and vibrant pacifiers are sure to get noticed and bring lots of smiles. Here is Where to Buy Mustache Pacifiers. I offer FREE Custom Designing Services on thousands of Zazzle customizable products. CALL, me, Little Linda Pinda Designs, to create your baby shower gift ideas for boys and girls. Personalized Baby Shower Party Supplies and more. 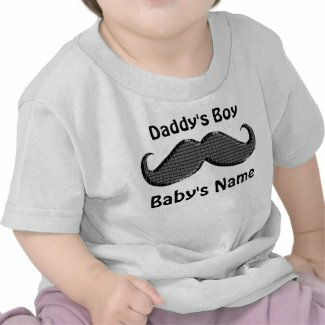 Mustache Binky, Shirts and other funny Mustache Gifts for everyone.